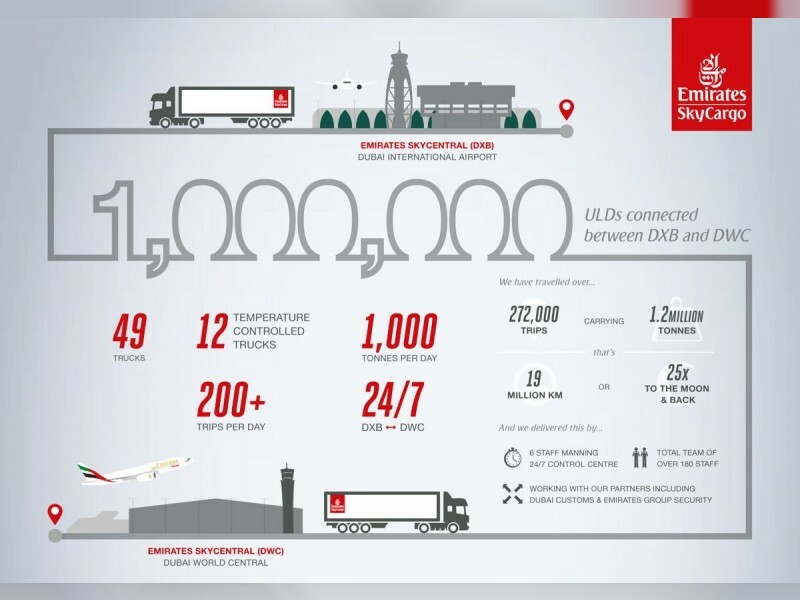 DUBAI, 12th September, 2018 (WAM) -- Emirates SkyCargo has announced that it has transported the one millionth Unit Loading Device, ULD, through its bonded corridor trucking service connecting the Dubai International Airport, DXB, and the Dubai World Central, DWC. The trucking service allows for rapid connection of cargo between Emirates’ passenger and freighter aircraft. Emirates SkyCargo launched the trucking corridor in April 2014, when the air cargo carrier first commenced freighter flights from the DWC. A fleet of 49 trucks, including 12 refrigerated trucks for temperature-sensitive goods, links cargo between the two airports on a 24x7 basis. Emirates SkyCargo facilitates global trade by connecting cargo across 160 international destinations through its hub in Dubai where it has two state-of-the-art Emirates SkyCentral cargo terminals. Cargo arriving in Dubai often needs to connect from passenger flights to freighters or vice versa for their onward journey. "Emirates SkyCargo is the only air cargo carrier to operate a two-airport cargo hub capable of handling close to three million tonnes of cargo in a year. Our fleet of 49 trucks function similar to a continuously rolling conveyor belt allowing connection times of 4.5 hours between cargo arrival at one airport and departure from the other, thereby effectively integrating two airports into a single hub," said Henrik Ambak, Emirates Senior Vice President, Cargo Operations Worldwide. "Moving one million ULDs through Emirates SkyCargo’s bonded virtual corridor in just four years is a testimony to the critical importance of this service to our total offering," he added. Over the last four years, the trucking service has helped connect more than one million ULDs over more than 272,000 trips between the two airports. A total of over 1.2 million tonnes of cargo, ranging from temperature-sensitive pharmaceuticals and perishables to luxury cars, has been shuttled by the fleet of trucks. The fleet of trucks is maintained and operated by Allied Transport Company, based out of Dubai South, on behalf of Emirates SkyCargo. "In order to ensure the safety of cargo in transit, all the trucks in the fleet are equipped with satellite tracking and operate in a pre-determined geo-fenced route between the airports. The operation of the trucking service, which carries close to 1,000 tonnes of cargo every day, is planned and monitored round the clock by a dedicated team. The trucks are also fitted with tamper-proof locks for each journey, verified by Emirates Group Security and Dubai Customs, providing an additional layer of security of transit shipments," commented Percis Paghdiwalla, Emirates Road Feeder Network Manager.